The third, unknown type of static didn't always come from the same place in the sky. Instead, a few months of observations revealed that the location of maximum static moved across the sky on roughly a 24-hour cycle. Jansky naturally guessed that this noise was extraterrestrial, or not from Earth, and initially proposed the Sun as the source. 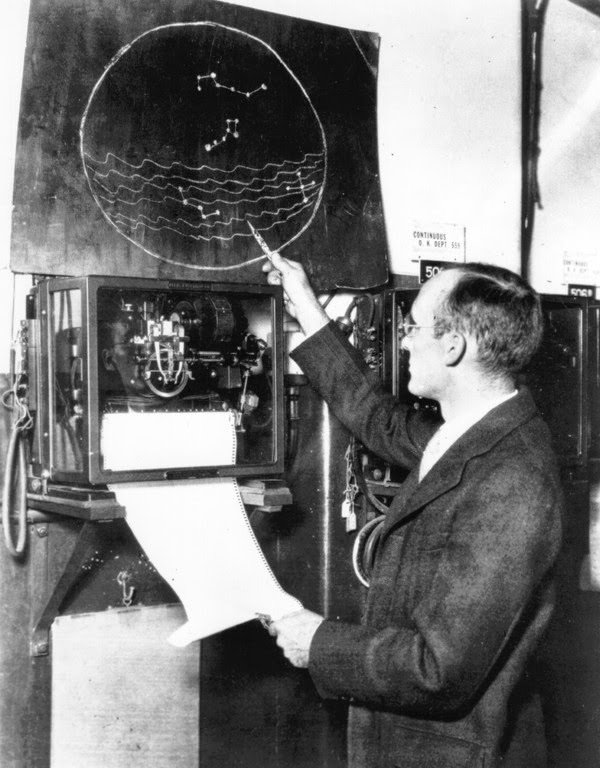 Karl Jansky with his "merry-go-round" radio antenna that discovered radio waves from outer space. Within a year, however, further observations revealed a cycle that was 4 minutes less than 24 hours, and precisely equal to the length of a sidereal day, a measure of the Earth's rotation with respect to the stars instead of the Sun. This meant that the unknown static was coming from somewhere beyond the Solar System. The level of the static was never high but Jansky described its presence during otherwise quiet periods as "unmistakable". In a 1933 paper, Jansky was cautious about suggesting an origin for this mysterious signal, but pointed out that it appeared to come from "the Milky Way in the direction of Sagittarius". Sagittarius is a teapot-shaped constellation that marks the direction of the center of the Milky Way, designated Sagittarius A*. Today we know that a supermassive black hole lurks in the center and that the high-energy material circling around the black hole emits a large radio signal. Jansky discovered that the center of the Milky Way is a strong source of radio waves. 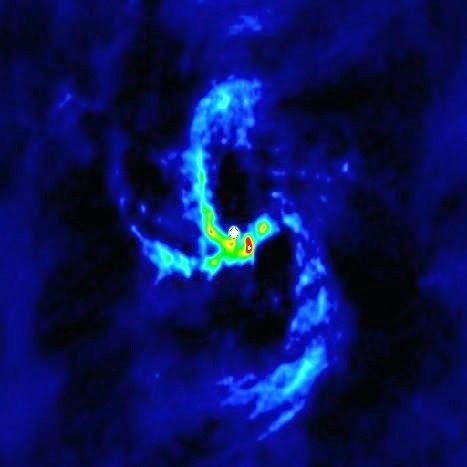 This 1993 image shows how the galaxy center appears in radio—the bright white spot in the center is the supermassive black hole known as Sagittarius A* and the spiral arms are streams of hot gas swirling around the black hole. 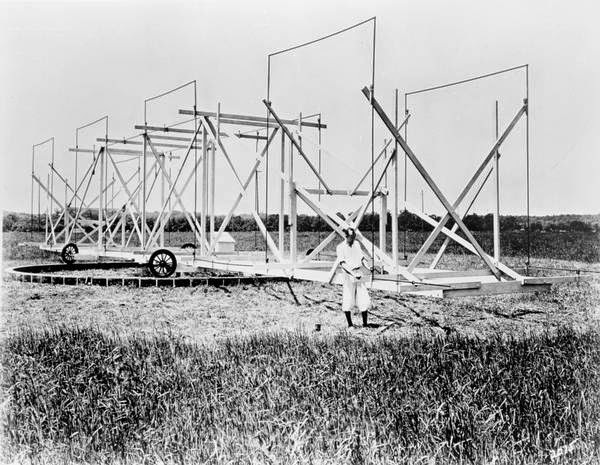 All because of a simple quest to reduce static noise in phone calls, Jansky unwittingly discovered the first source of cosmic radio waves, opening up the field of radio astronomy. Astronomers later found that most astronomical objects, including our Sun, Jupiter, and other stars and galaxies, emit radio waves. Jansky was not an astronomer but he was intrigued by his cosmic discovery and wanted to continue the work further. However, Bell Labs assigned him to another project and he never worked in astronomy again. Today Karl Jansky is known as the "father of radio astronomy" and is recognized with an astronomical unit—the Jansky is a measure of how bright a radio source appears from Earth. He would undoubtedly be pleased to know that the most ambitious astronomical project to date is a radio telescope soon to begin construction. The Square Kilometre Array will be the largest, most advanced telescope in the world, but many of the techniques (and issues with static noise) that it encounters will be the same as Jansky pioneered 85 years ago. The New York Times heralded Jansky's discovery on May 5th, 1933. In 1964, Arno Penzias and Robert Wilson, also engineers with Bell Telephone Laboratories tasked with tracking down radio noise, discovered the smoking gun of the Big Bang, the Cosmic Microwave Background. They won the Nobel Prize in 1978. 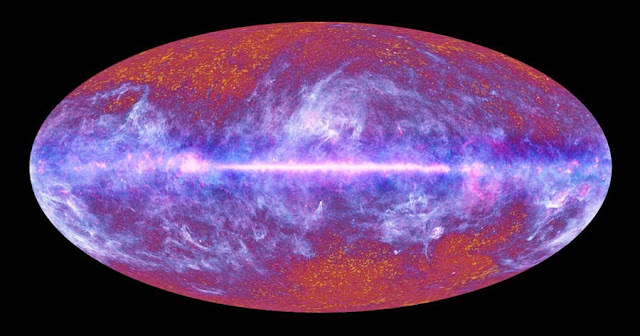 You can listen to the CMB signal here, with narration by Robert Wilson. The National Radio Astronomy Observatory in Green Bank, West Virginia hosts a working replica of Jansky's "merry-go-round" antenna, built in 1964 and refurbished in 1995-1996. No mention of Grote Reber, the first radio astronomer? Reber's actual dish antenna has a place at the NRAO in Green Bank too, in view of a replica of the Jansky antenna.